Receive alerts when there is activity in your Showroom, eCommerce or Accounting. You can specify which users within your organization receive these alerts and how they receive them: Email, Dashboard or both. To configure notification, go to Settings>Users and Permissions. 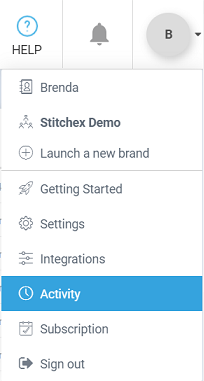 Click on the pencil beside their name and scroll down to the Notifications section to specify which emails notifications they receive and how they receive them. Dashboard notifications appear in red on the bell at the top right of your screen. Soon we will be adding shipping as another category of notification. 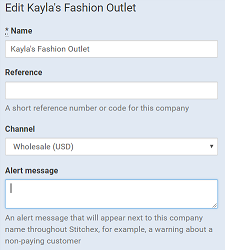 You can also configure Alert Messages for your Customers that will appear next to the company name throughout Stitchex (e.g. warning about a non-paying customer). To configure these alerts, navigate to your Contacts>Customers and open a particular customer. Type the Alert message you want displayed in the "Alert Message" field. If you are an admin/owner, you can configure these options for all your users at Settings > Users and permissions.